At the heart of Central Florida, Orlando-based Clever Energy provides home solar systems and solar home energy products to homeowners from Deltona to Saint Cloud and beyond. Thanks to the knowledgeable team and skilled technicians at Clever Energy, converting your Orlando or Altamonte Springs house into a functional solar home is more feasible than ever. Clever Energy can equip your Orlando home with the most effective photovoltaic cells and battery storage systems, turning your Cape Cod into a Wadeview Park solar home wonder. You’ll rest easy in your solar home in Altamonte Springs’ Tranquility Cove neighborhood, knowing that you’re saving money on your utility bill while significantly reducing your carbon footprint. Not only is the sun a bountiful source of renewable energy for electric power generation, its light and heat can be leveraged to reap other benefits. 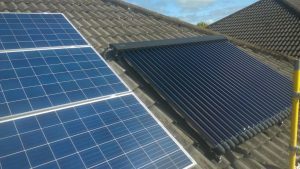 In addition to generating power that minimizes your reliance on the grid—and which may even be enough to sell back to your local utility—a solar home optimized by Clever Energy can include features such as a solar-powered attic ventilation fan or a solar domestic hot water heater. A home solar system from Clever Energy is the most convenient and reliable way to harness the clean, renewable energy of the sun for your home’s power needs. Oviedo homeowners in Alfaya Woods, Kingsbridge East Village, and Bentley Cove can enjoy considerable savings on their regular electric bills the very first month their home solar systems are in operation. Clever Energy doesn’t ask for any money down to get started. Casselberry homeowners in Crystal Bowl don’t need a crystal ball to predict home solar system charges every month—your payments will be consistent, with no hidden fees. Denizens of Deltona and other Central Florida cities can take advantage of a substantial federal tax credit when they purchase a home solar system from Clever Energy. In addition, a home solar system installed by Clever Energy will make you eligible to participate in a net metering arrangement with Florida Power & Light or Duke Energy. Simply put, Duke or FPL will credit you for all the electricity produced by your home solar system. The power your solar cells yield during the day will offset electricity you use from the grid at night. And, if your home is in a particularly sunny spot and you produce enough solar energy through your home solar system to send power back to the grid, you will also be credited for the electricity that you supply. Straddling Lake Tohopekaliga and East Lake Tohopekaliga, neighboring towns Kissimmee and Saint Cloud are both blessed with lush greenery and copious sunshine. Like Rumpelstiltskin turning straw into gold, Clever Energy turns this golden sunshine into solar home energy for Saint Cloud and Kissimmee homeowners. If you live in Central Florida and want to take advantage of the Sun Belt’s greatest natural resource, give Clever Energy a call at (407) 274-1531 or send an email to info@gocleverenergy.com for more information. We’ll schedule a free consultation, performing a comprehensive solar home energy analysis to show you how much you can save by going solar. Subject to applicable terms and conditions. Eligibility and savings are determined by municipal utility, roof condition and roof space, azimuth, tree location, shading and other factors. Go solar Now! Get a free solar quote today to get started.